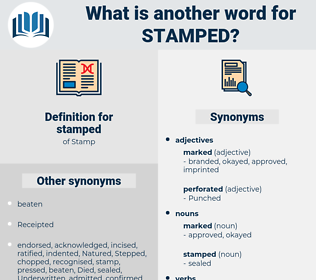 What is another word for stamped? stopped, strucked, Eliminated, authenticated, stricken, implicated, characterised, Stencilled, Imparted, Enumerated, advertised, stained, characterized, staffed, taped, registered, Contemplated, Displayed, posted, impressed, impacted, Inserted, Minted, printed, Accommodated, Encompassed, reprinted, stabbed, Issued, stuck, Indicated, afflicted, disqualified, maltreated, cast, Inspected, Exhibited, dominated, Captured, Appended, listed, engraved, struck, targetted, Punctuated, prescribed, plagued, Flagged, Installed, put, Mentioned, written, tainted, applied, beset, endorsed, envisioned, subscribed, shaped, battered, Influenced, Aimed, signalled, beaten, specified, HIT, inscribed, saved, described, referenced, attached, Targeted, coloured, Endeavored, Enshrined, pursued, Denoted, Recruited, encumbered, shot, affixed, carved, entrenched, checked, disclosed, Inflicted, ended, heralded, buffered, Pervaded, placed, typed, Surveyed, marred, etched, amazed, Dialed, scheduled, imbued, desired, scarred, shaken, conditioned, whacked, effected, embedded, seared, filmed, sown, Shown, Knocked, Befallen, Anchored, clocked, fixed, equipped, Ushered, remembered, touched, enrolled, Boarded, Entered, intended, filled, banded, Fitted, Scored, engulfed, sought, Blazed, buried, kicked, endowed, burned, Referred, made, named, sealed, Punched. She stamped her foot in passion. Philippina stamped the floor with her foot. 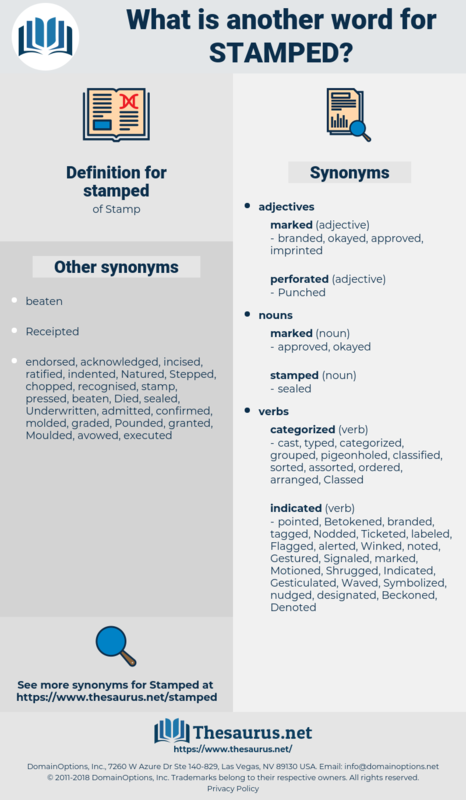 stamp out, satinpod, stamp duty, stampede, steam bath, steamboat, stone pit, stamp pad.